I was asked to present at the VMUG in Melbourne in late 2013. At the time I was working at ESTA. They provide 000 Call taking for Emergency Services (The same as 911 for the US!). I decided to talk about Network Architecture and the evolving landscape of networks at the time. I wasn’t a Virtual Infrastructure guy them. I am not now though I have a better idea of what a hypervisor can do 😉 !. My presentation was “Strength of Titans – Building Networks that Support Vertical Growth”. Before this I had not presented much publicly. I actually never had presented at an event. Just internal meetings or discussions. I re-presented this again with some modifications at the January 2014 VMware User Conference. This was my presentation. Last week was the 2015 VMUG User Conference. I was watching the introduction keynote by Craig Waters about the importance of Community, blogging, and how a the technology industry has an awesome community. The community that gets together, talks about problems, collectively solves many things and more. It was during this presentation I was called out. I won “Best Community Presentation of 2014”. I was shocked. There was lots of great presentations that year. New Topics, new technology and many new faces. It was quite the honor to get this and I had no idea it was planned. The Register actually sponsored this prize and was giving out an Atari Flashback 5 console for the winner. Whilst for many, I was too young to experience the Atari (I am 27), the Sega Mega Drive was my first console and it had newer versions of these Atari Classics. 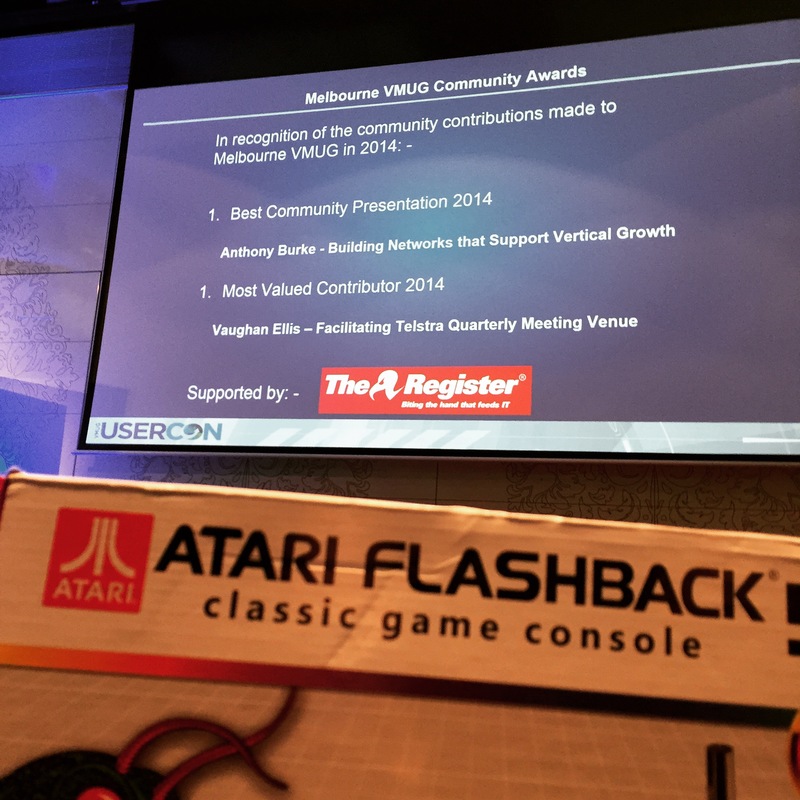 After letting it sink in I have reflected a little on what a community, the local user groups, and the technology fraternity means to me personally. Blog – It all started as a method to cure professional isolation. I was by myself. I needed to share thoughts, soundboard ideas, and I wanted to give back. I read a lot of blogs that helped me solve problems, challenges, and allowed me to learn. I started writing and kept doing it. I wrote every fortnight. This led to me being picked up by Tech Field Day. I wrote about how was the moment and event that pivoted my career direction. It made me hunger for so much more. Career – without a doubt my social presence has influence my career. Namely using Twitter initially to promote my blog and interact with others it has now become my primary source of information gathering. My career has being influenced by my blog and my social presence. People were aware of what I was doing, some times before I met them, and were looking to talk about things I had written. Public Speaking – This is something that everyone should do. There are numerous user groups, numerous calls for papers and there are people like yourselves that want to hear what YOU are doing. Yes these events can be sponsored or owned by vendors. Yes there may be some marketing. These days there are entire streams dedicated to customers, dedicated to users, and all these people do is share and give back. Reach out and speak to organisers. It may just change your career. There is no harm in getting up and sharing something cool. This might be a new design, commentary on the industry, technology, the baptisms of fire you’ve had or more! So what are you waiting for? If you read blogs a lot start commenting. If you don’t have one, get one. Don’t worry about a readership and just write. Use Twitter and social media. Get on to IRC or Slack and get talking. Attend events and introduce yourselves to people (and twitter friends!). Get amongst it. The community for so many people is what defines the career. I would be not alone in my reflections in this blog post. Have you spoken to your community lately? I’ve recently started blogging for the same reasons as yourself; sharing and clarifying thoughts and engaging with the community. It feels good, I just need to keep it up! Just to say this post and your blog are an inspiration for this and a great source of knowledge, thanks. Thanks Rob. Welcome aboard. Just write down what ever you’re thinking about. Don’t pay attention to things like “I am sure this has been covered before” or “No one reads this”.